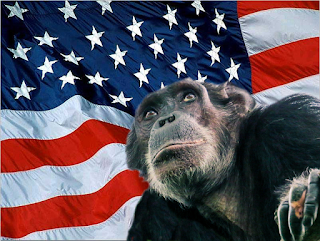 Ruminations: Pot-smoking Chimps and the Seductive Power of Power. Pot-smoking Chimps and the Seductive Power of Power. In my last post, SC may legalize pot, and this libertarian doesn't care, I pointed out that my libertarian position is not dependent on a desire for legalized drugs, but for increased liberty. I don't much care for recreational drugs, and I'm not in favor of laws to "legalize" them. I'd much prefer to get rid of the unnecessary laws that criminalize them. Adult citizens can and should be empowered to make such decisions for themselves. Now, as sometimes happens, even when I take a conservative position ("I don't like drugs"), I fall on the foul side of people on the Right ("'Decriminalize'? What'choo talkin' 'bout, Willis?"). That has happened here. It has now been suggested to me that I'd rethink my position if I had teenagers. My response was, I think, measured. The fact is I have three sons, and no... that doesn't make me re-think my position. Nor should it. You see, nothing really prevents teenagers from having ready access to drugs. I daresay that they can get them as readily (or moreso) than you can. The law has never stopped them, just as it never stopped my peers when I was in high school in the 70s. Nevertheless, not only did I not turn to drugs, but those of my peers who did smoke turned out OK.
No one was ever cured of alcoholism by Prohibition. That's just another drug, and the problem with drug abuse and addiction isn't something that's fixable through legislation. My kids don't do drugs not because of fear of the law, but because they have the confidence to make their own decisions. Part of my job as a parent was to inculcate in them exactly that confidence. It comes from knowing Right from Wrong and choosing Right. My youngest two have recently turned 19. It may be that they'll take up some drugs someday, and it's quite beyond my ability to prevent at this point. But I doubt it, because education and attention alone seems to have worked quite well to get them past that suggestible stage. You may find that the greatest part of peer pressure is not knowing your own mind. In today's world of fatherless, rudderless households, this is exacerbated by having been trained by "the authorities" from an early age that others should do your thinking for you. "Don't try this at home, kids!" Sound familiar? It means, "Do as I say, not as I do." When you use this sad cliche your underlying message is that you are specially privileged in a way that they are not. When you're talking to a minor, that's fine because you are privileged by age and experience. Not so when you're talking to adults. When they have attained the age of majority, your days of condescension should have come to a close. While you may still have experience they don't, they now are of an age where they can determine for themselves whether to follow your advice. They're adults, just like you. But, comes the answer, I prefer to have the law as a tool on my side. That's great for you when the law is backing up decisions that you would make for yourself. But other people like having the law as a tool on their side to help them prevent bad behavior, too. That becomes a real problem for you when they're trying to prevent behavior that you find either desirable or totally innocuous and no one else's business. The law is not and has never been intended to be a tool that exists for the purpose of extending your will. Even when you wield it, this "tool" erodes your liberty in ways that you cannot argue against, as you are admittedly in favor of such controls in principle. It's only when you're not holding the reigns that it becomes a problem. How, for instance, is it possible for you to argue against Sharia law when it is patiently explained to you that it is a "tool" to help prevent bad behavior and bring people closer to Allah? Are you going to claim the exercise of Liberty that you so frequently toss in the ashcan when applied to others? This sounds entirely hypocritical... like it's nothing more than a double-standard. Which of course it is. And your argument is now doomed, your logic expended. All that's left to you is the exercise of power, which will destroy you as soon as it falls into the hands of the "other side". You can't even complain about that, because you did it. And that's exactly the refrain we hear in politics today: "But they did it, too!" As if that's alright. "Now, as I don't do drugs, and you don't do drugs, and the two of us presumably teach our children the same thing, I doubt that there is any disagreement between us as to whether someone should do drugs. "However.. I have no moral dilemma when it comes to asserting my liberty, as I do believe in asserting that same privilege even to those who make decisions for themselves that I would not make in their shoes. Considering that this is the Constitutional approach, I personally consider it far more 'conservative' than any interventionist approach. I realize that this is not the current state of the language... I simply hold that it's the language at fault and not my position." I don't intend for that to sound confrontational. I'm largely describing the point at which I personally came to the conclusion that it is this acceptance of inconsistency causes far more and greater problems than the Left or Right are trying to solve. Both the Left and Right attempt to assert control over individuals who, if we truly believe the high-sounding words of the Declaration, are created equal to those who would 'govern' them. When I saw that this was equally true of my own position, then I had no alternative but to recognize my own hypocrisy and reject it. So now I'm politically Libertarian (because -- on paper -- our government can be described as nothing else), while continuing to advocate and make for myself conservative choices. And that's OK, because no one has ever been brought to God by the imposition of another man's will; just as no one has ever been made generous by being taxed, or virtuous by being fined, or content by being confined. These are things that people come to of their own accord, given free will and positive examples. "That's all fine. Personally, I don't want that crap around!" What is more dangerous to society and this country... a neighbor who smokes pot in his own place, or an intrusive government that wishes to control my actions? The intrusive government. That's FAR more dangerous.